Our 1967 Ford Mustang Convertible. Pick up from Adelaide (Prospect), SA. Seats 4/5. Automatic Gearbox. Power Roof. By the size of the smile on my brothers face and his family , I’d say it was clear “Rocky” was a real success…..so thank you !!! I hope to book again soon. Carlo. Many of you will see “Rocky” as being a great wedding car. Others for your son or daughter’s formal, but everyone hankers after driving a classic Mustang. That car chase cemented the American iconic status of the Mustang in the sixties along with The Beach Boys, Woodstock, Barbie and Ken, Jimi Hendrix and The Doors. “Rocky” is from 1967. Each year Ford made detail changes to the car and the ‘67 or ‘68 models are generally considered to be the best design for the sixties. Earlier models had a fifties look and later ones drifted towards the bulbous seventies look. Mustangs came with either a 6 cylinder engine or a 289 cubic inch V8. Especially if you have seen Steve McQueen’s Bullit. If you love Mustangs and haven’t seen the 1968 classic movie, then you must. The car chase between McQueen and the bad guys is one of the classic car chases of all time. Especially as there was no CGI or special effects to help. The bad guys are in a Dodge Charger. McQueen is in a Mustang doing 100 mph through the streets of San Francisco. Needless to say, McQueen wins but I won’t spoil the chase by telling you how! “Rocky” is a V8, of course, but we also decided that 289 cubic inches was for pussies so we dropped in a 351 cubic inch Cleveland motor. Close to 6 litres of awesome, ear popping power! “Rocky” has also been professionally converted to right hand drive (Mustangs were only ever made in left hand drive form), with upgraded power brakes, 3 speed automatic gearbox and super light, power steering. “Rocky” has a power roof – which looks really cool at the traffic lights when you flick the switch and everyone stares as it lifts up into the air and parks itself perfectly. Well, almost perfectly. And it doesn’t leak – much. “Rocky” also has a modern CD player with MP3 input to play your favourite Beach Boys and Doors tracks. Mind you, “Rocky’s” own sound system does tend to drown it out. 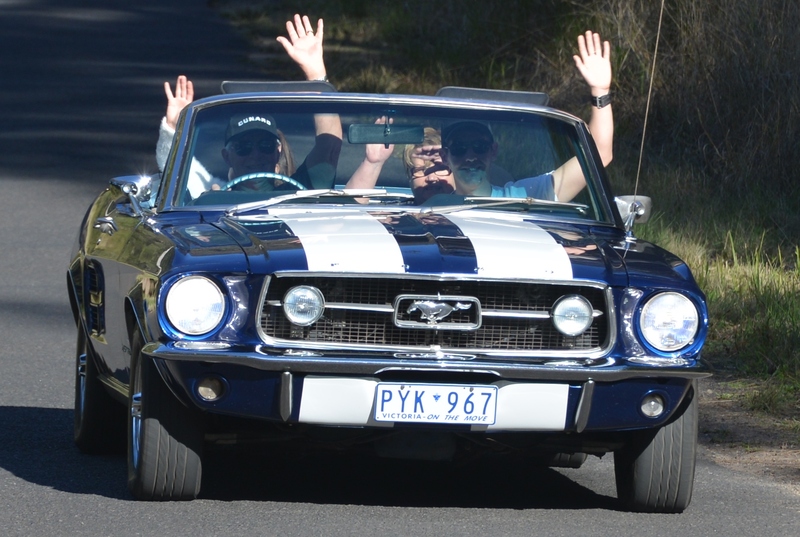 It is hard to compete with the sound from that 6 litre V8 through twin exhausts.You do have to have the right pose when driving a Mustang though – hood down, shades and baseball cap on, right elbow on the door, finger tips on the steering wheel, left arm around the blonde. Just make sure it is the right blonde if you are using “Rocky” as a wedding car! You are allowed to remove your arm from the blonde to acknowledge the compliments – for the car, not for the blonde. 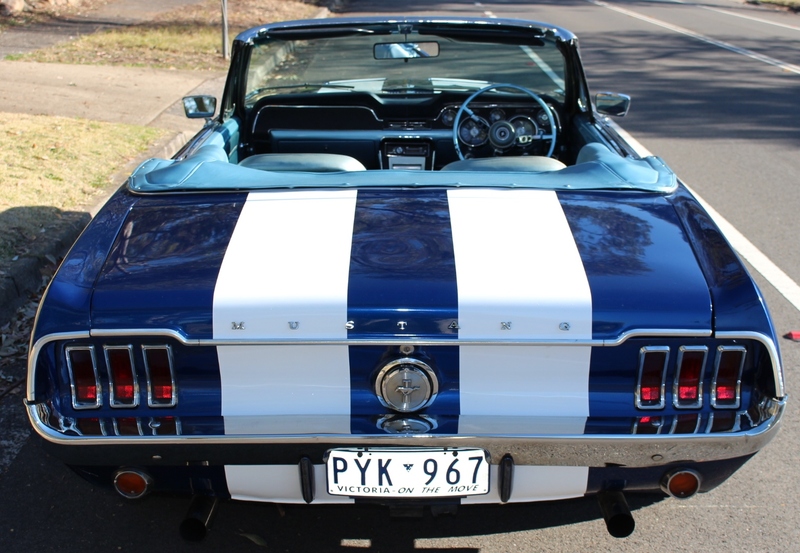 “Nice ‘stang mate”; “Beaut car”; “Awesome”; “Mustang!” Truckies, school kids, mums and dads, tourists, everyone loves “Rocky” – and you will too.